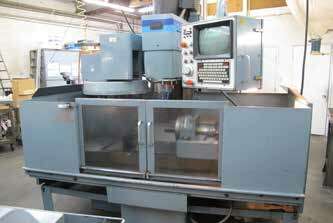 4) HARDINGE OMNI-TURN CNC 2ND OP GANG LATHES WITH OT-CNC4 CONTROL. 3) HARDINGE OMNI TURN 2ND OP GANG LATHES WITH OT-CNC CONTROLS. HARDINGE CNC CHUCKER WITH FANUC 6T CONTROL. FEELER CNC LATHE WITH OMNI TURN OT-CNC CONTROL. HARDINGE HC CHUCKER, S/N 6036-T.
HARDINGE CNC GANG TOOL LATHE WITH FAGOR CONTROL. HADRING DSM-59 2ND OP LATHE. UPGRADE CNC GANG TOOL LATHE WITH FANUC 21i-T CONTROL. 2) FADAL VMC-40 CNC VMC, CT 40, 4TH AXIS READY. 7) TORNOS R-10 SWISS AUTO SCREW MACHINES, 10 mm BAR CAPACITY. BECHLER CR-32 SWISS AUTO LATHE MACHINE. BADGER TOOL ROOM LATHE WITH ENGLISH AND METRIC THREADING. LE BLOND REGAL 12’’ X 36’’ ENGINE LATHE. 4) CLAUSING MODEL 8520 MINI MILLS. BRIDGEPORT VERTICAL MILL, 2HP, CHROME WAYS AND DRO. BALDOR GRINDER, DRILL PRESSES, PRESTO LIFTS, TOOLING, CARTS, SHELVING. 100’S OF PRECISION TOOLS, COLLETS, VISES, HOLDERS, CUTTING TOOLS AND ETC. INSPECTION TOOLS, GAGES, COMPARATOR AND ETC.